E-mails tend to be repetitive. Many are written in the same way with similar, if not identical, content. To avoid reinventing the wheel on a daily basis, you often find yourself searching for previous e-mails that have similar wording that can then be reused. This works well if you have small amounts of e-mail and a very good memory, however, it loses efficiency very quickly. Searching takes time, distracts you from the task at hand, and leads to an undesirable range of options. 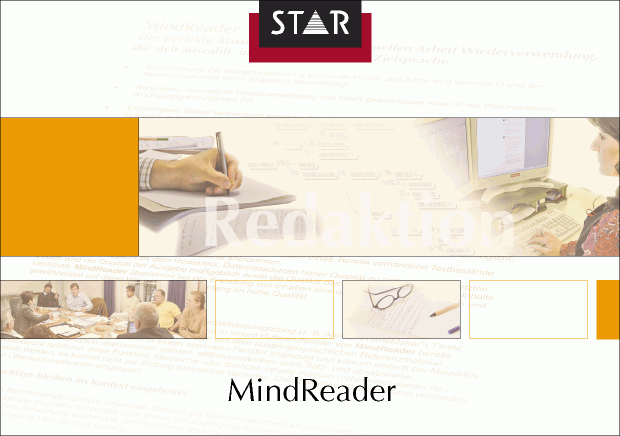 MindReader performs the tedious task of searching for you and expands your memory with substantial volumes of text. MindReader helps you select the best text suggestion, supports the use of correct terminology, and makes sources available that were previously hidden. This allows you to concentrate on the content that is actually new—this is what we call the Delta Principle. It lays the foundation for efficient and accurate writing. Consistent texts considerably reduce cost and time expenditures, while correct terminology ensures accurate communication.